This production of the well-known story pleased the audience I was with, and there were lots of audible reactions from the kids, with applause at the end. I think it might be a hit at Christmas-time. The colorful animations, sets, and CGI effects; the Christmas messages that put presents and material things into perspective; and liberal doses of humor and good cheer make it the kind of film that appeals to children and their parents. Noteworthy for our times is its message about forgiveness of those who do wrong. Although I never saw it, there was a 1967 version of the story (How the Grinch Stole Christmas) that was a huge success, which makes me question once again why remakes are made of already successful movies. Has the technology progressed so much since 1967 that a new version is called for? At any rate, the expressive voices of the actors contribute to the overall quality of this version of The Grinch. 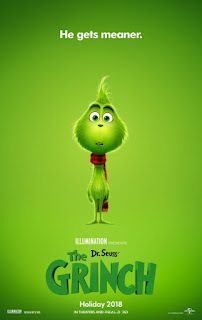 Although I had difficulty “placing” Cumberbatch’s Grinch, he did very well as usual, covering a range of emotions from a grouchy “Bah, Humbug!” to the lost, lonely boy of young Grinch, to his grudgingly being brought to heel about the whole Christmas thing. This version of The Grinch accounts for his attitude based on his history. Cameron Seely’s Cindy Lou Who is a stand out performance that makes us love and appreciate her spunkiness, caring, and leadership. Bringing his comedic talent to bear, Kenan Thompson perfectly captures Bricklebaum, who sees/hears/speaks no evil, always putting a positive spin even on Grinch at his worst. Finally, Pharrel Williams’ narration comes in at just the right times, with a clear voice to move the story along. Congratulations to screenwriters Michael LeSieur and Tommy Swerdlow for preserving the wholesome messages of the Seuss book, and my own special appreciation for their refraining from the usually obligatory fart and poop jokes in most movies for children. It could be I missed something, but I think they avoided references to such things completely. The music of Danny Elfman and the art direction of Colin Stimson further embellish the qualities above. Directors Yarrow Cheney and Scott Mosier can be proud of the team they assembled and their leadership in making the movie sing (actually and metaphorically). I don’t know whether kids will pick up on this or not, but it seems like they might ask where the real Santa was all this time. The Whos wake up on Christmas morning to find their holiday decorations trashed and their gifts missing. Where was the real Santa? Of course, the film is for those old enough to know that it’s the parents who bring the gifts to the house. Maybe small children who still believe in Santa shouldn’t see the film. Parents, be warned. Can the Grinch steal Christmas from Whoville?